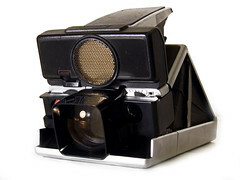 The SX-70 is a folding single lens reflex Land Camera first produced by the Polaroid Corporation in 1972. It was the first instant SLR in history, and the first camera to use Polaroid's new integral print film, which developed automatically without the need for intervention from the photographer. This was revolutionary at the time, and a precursor to today's 600 and Spectra films. The SX-70 has a folding body design, a 4-element 116mm f/8 glass lens, and an automatic exposure system. The camera allows manual focus as close as 26.4cm (10.4"), and has a shutter speed range from 1/175s to more than 10 seconds. A variety of models was offered, though all share the same basic design. Later models have an ultrasonic rangefinder autofocusing system known as Sonar. The Model 3 departs from the other models since it isn't a SLR, but instead has the viewfinder cut into the mirror hood. All models feature an electronically controlled 'flash-bar' socket across the top of the camera, for insertion of a 10-times use flashbulb unit. Polaroid - as well as other companies - made external flash units that plugged into this socket. 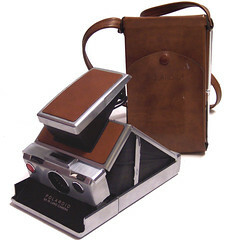 As well as the folding SLR model, a variety of non-folding, 'consumer'-type models were released that also used to SX-70 integral film. External flash - Several models were made, including several by third parties. Tripod Adaptor - Many earlier models of the SX-70 did not have tripod mounts built-in. One feature of the SX-70's integral print film is its ability to be manipulated while still developing. Because it is an instant film and develops over a period of several minutes, artists are able to "push" the emulsion material around the photograph to produce effects somewhat like impressionist paintings. Also, the image has a low resolution. 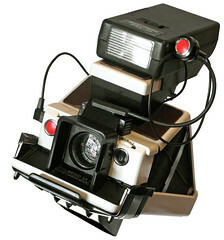 Polaroid's SX-70 film was last produced in December 2005, and was sold out by March, 2006. What little remains often suffers from flat batteries or dried-up chemicals. A film called Artistic Time Zero could be manipulated as the photo developed, by pushing the colours around before they set. SX-70 five alternatives for shooting film, four of which will allow the use of readily available, inexpensive 600/779 film in their cameras, and the fifth of which provides a private-labelled 600 variant that can be used as if it actually were the earlier film. First, some SX-70 owners modify their cameras to use Polaroid's more recent 600 film, which is still available despite also being out of production. SX-70 and 600 film packs are slightly different, however, as the 600 pack has some extra little 'nubs' at the front of the pack. Users can use an old photo or a dark slide from a used Polaroid film cartridge to help slide the 600 film into the camera or just remove the nubs from the cartridge using nail clippers. The real problem with using 600 or 779 film is that it is significantly faster than SX-70 film (ISO 640 as opposed to ISO 150), causing serious overexposure by the old cameras. To address this issue, some simply set the exposure dial all the way to "darken" and replace the small Neutral Density filter over the electronic eye with a similar clear filter. Polaroid itself recommends placing a 1-stop ND filter over the lens, and replacing the small ND filter over the electronic eye with a clear piece of plastic (as from a CD case). But, even with these modifications, SX-70 users may find they still need to set the exposure controls fully to "darken." Second, perhaps the most effective solution is to adapt the SX-70's exposure sensors and electronics to accept the current film's higher speed. A professional conversion of the camera can be obtained from a technician on the US West Coast, and possibly others. He adapts the electronics of the camera so that the light sensors and circuits will operate at the ASA 640 speed of the current film [as opposed to the ASA 150 speed of the earlier film]. The benefit of this procedure is that the camera can take advantage of the far faster, modern film without the use of filters or other apparatus. Third, It has been determined that a 28 mm, threaded, ND-4 filter, or a similarly-sized, quality glass 2-stop Neutral Density [ND-4] filter can be gently screwed into the barrel or placed over the lens of a folding SX-70, to "fool" the camera into believing that the 600 film inside is actually the ASA 150 film it was intended to use. This works quite well, and the cost for a good filter is between US$30 and $85. There is also a thin gel filter available, which is glued onto the front of the folding SX-70's lens. One of these typically costs about US$15, but it is far less durable than a good glass filter. The disadvantage of most glass filters is that [a] they must be removed in order to close the camera [and reinstalled for the next use], and [b] they darken the view through the SLR viewfinder to the extent that focusing is almost impossible in low-light situations. Fourth, there is a laminated film filter that can be slipped into the 600 film cartridge before it is installed into the camera. It is slid into the pack above the dark slide, but under the cartridge's edges. In use, it is directly in contact with the photo film, as was the dark slide, so that there is no space between it and the photo to permit light bending and distortion. The "PackFilter" is removable when the cartridge is empty, and can be used indefinitely. It is washable, in the event of too much handling, and the ND film is well protected with a special, heavy, durable polyester laminate on both sides. Even so, it is less than 10mm thick. It is also somewhat more than ND-4, since the 600 film is actually ASA 640 [more than two stops faster than TimeZero film], and the 30-year-old SX-70's have often slowed down a bit over time, increasing their tendency to overexpose. Another advantage is that they can be used in any camera intended for SX-70 film, not just folding SX-70 SLR's. Their disadvantage is that they are easy to throw away with an exposed film cartridge. Fifth, and finally, an Austrian company has contracted with the Polaroid film plant in the Netherlands to Private Label a variant of 600 film for them, using the old TimeZero film cartridge design, without the annoying "nubs". As described by its US distributor, below, it works beautifully, on the same basic principle as the PackFilter, above. Its only disadvantage is that is costs more than twice as much as 600 film purchased from any mass merchandiser. In October 2006, a brand new SX-70 film was introduced. According to its producer, it uses an internal neutral-density filter and modified chemistry to yield vibrant colors, strong contrast, and high resolution. This professional-grade film was made by Polaroid in the Netherlands. As the cartridge is made to its original specifications and the ND filter is placed over the film and not the lens, it allows for full and normal use of all the camera's functions. The only disadvantage is that this film is not "manipulable" as was the original SX-70 film, a disappointing loss to artists who could make original prints look like paintings simply by manipulating the gels and chemicals inside the photo by carefully pushing them around. The following are sample images shot with Polaroid SX-70 Blend film. They are courtesy of Lord of the Lens, the North American distributor for SX-70 Blend. A company known as The Impossible Project, has introduced the newly-manufactured SX-70 compatible film in black & white and color, with the old Polaroid factory in Enschede being the manufacturing base. 600 film is also available, along with possible color film packs, 8x10, and 20x24 sizes. MINT in Hong Kong is selling not only refurbished SX-70 and other models but also has two SX-70 bodies with new interiors, the SLR670 (SRL680 electronics in the SX-70 body, using 600 film without ND filter) and the SLR670m , which contains a completely newly developed motherboard an a manual time setting, called the "Time Machine". In 2015, MiNT released the world's first twin lens reflex instant camera - InstantFlex TL70. After five years of making and remaking vintage cameras, MiNT engineers set out to reinvent a much-loved classic camera. TL70 preserves the best features of the legendary camera such as Polaroid SX-70 and Rolleiflex TLR. TL70 leverages its unique features to unleash creativity. It is the most user-friendly TLR available and works with credit card size instant films 54(W) x 86(H)mm. With its 3-element lens and 5-leaf shutter blades, which are usually found in high end instant cameras, you will have more control over aperture for a greater range of creative expressions, and to maximize light transmission and improve image quality. SX-70 cameras on The Land List. Emulsional Problems - Gallery of SX-70 photographs by Michael Dare. SX70.dk - A Danish SX70 Polaroid Gallery by Lars Bregendahl Bro. Polanoid - A huge and ever-growing collection of more than 80,000 Polaroid photos. Information and online store of The Impossible Project. Information and online store of MINT in Hong Kong.